The wind-blown sand dunes of Stockton Beach comprise the largest continuous mobile sand mass in New South Wales, Australia and provide a great location for taking photos within 2 1/2 hours drive north of Sydney. The grains of sand on Stockton Beach have been washed in from the sea and blown ashore to form dunes up to thirty metres high. Most of the sand was deposited about six thousand years ago. 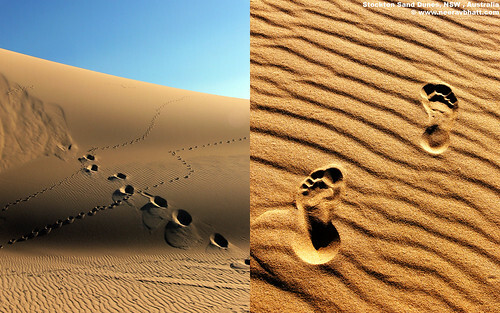 Download this 1680×1050 resolution desktop wallpaper photo of Footprints and Journeys in Stockton Sand Dunes. Did you know sand dunes look like they’re changing colour and texture during strong winds? they’re really beautiful. I’ve visited Stockton Sand Dunes several times. The last time I visited I recorded a video of me taking peaceful walk alone across a big dune against strong sandstorm winds which blew sand in the air and along dunes at surface level so the sand flowed like streams of water causing light and dark patches and patterns to constantly change. Take a real 4WD vehicle and make sure you buy a beach permit from the petrol station before you drive into the dunes. I went in a friends little SUV and it got stuck several times through lack of power and ground clearance. Make sure you deflate your tyres for sand driving in the car park, when you buy the beach permit they may be able to advise what PSI to set to. If you have an SLR camera, take a polarising filter and nuetral density filter if you’ve got one as well as lens hood, lens cleaning cloth and cleaning water/fluid to remove salt spray from your lens. if you’ve got one as well as lens hood, lens cleaning cloth and cleaning water/fluid to remove salt spray from your lens.